What happens when the orders stop? For years Traidcraft plc has partnered with poor producer groups in developing countries. Now that some of these partnerships are ending, we need your help to secure a new future for the people behind the products, and the thousands of others across the world who already rely on us. Swajan is one of Traidcraft plc’s oldest suppliers, producing beautiful hand embroidered cards. They work in rural areas and employ over 750 people, the majority of whom are women, who benefit from the safe working environment and flexible hours the company offers. With Traidcraft plc’s new model unable to buy from them, they face a 65% drop in orders, putting jobs at risk. SHAPII (Salay Handmade Products Industries Inc) was set up in 1987, and not only produce handmade paper and crafts, but supports a number of outreach projects - from the island’s first internet cafe, to schooling and education bursaries, to training programmes for young artisans. Without Traidcraft plc’s orders, they will suffer a significant loss of income - putting this amazing work at risk. 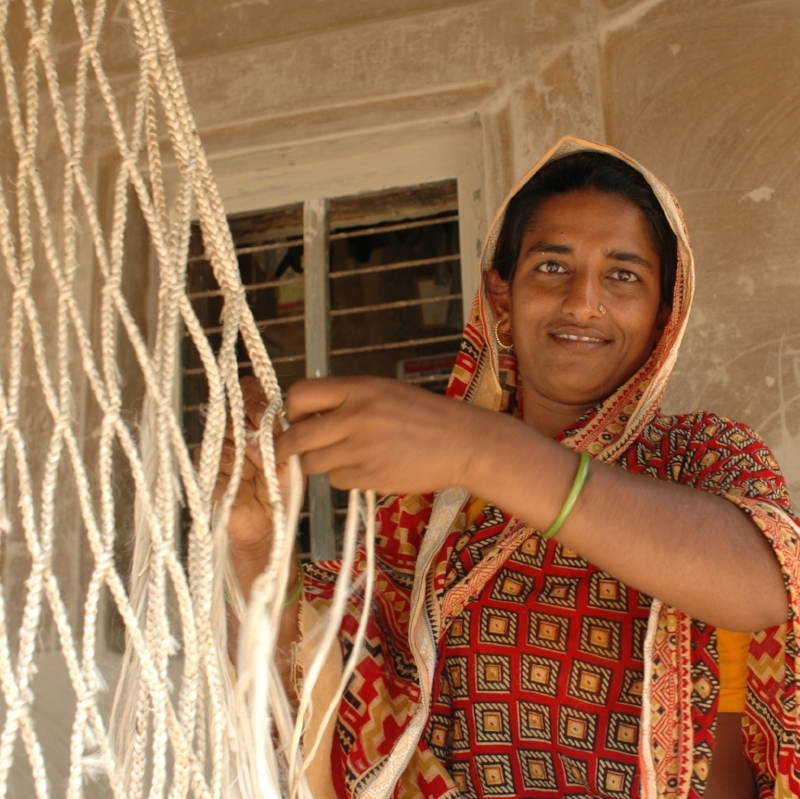 CORR Jute Works, in Bangladesh, was the very first producer group that Traidcraft plc worked with back in 1979 - without them, Traidcraft plc may never have existed. They also supplied products for Tearcraft. Employing nearly 5000 people, CORR – The Jute Works was set up in 1973 as a charitable trust, providing women weavers with the training and skills needed to make locally-grown jute products in the safety and comfort of their own homes. What support will we offer to the affected producer groups? But with your help, we will be able to offer producers tailored and tangible support - whether through introductions to alternative fair trade buyers, help with new designs and product updates, access to trade fairs, and where necessary, short term direct financial support. We are confident that together, we can help producer groups like Swajan, Noah’s Ark and SHAPPII to secure their futures. After all, we already work with over 300,000 people across the world, helping them to get a better deal from the hard work they do every day. As experts in trade, we are ideally placed to offer support to the producer groups most affected by Traidcraft plc’s restructure. We’ve worked alongside Traidcraft plc in close partnership since our very beginning, and our small team of experts are specialists in fair trade - but we need your help to ensure we have the resources to carry out this vital work. Why are we running this appeal? You may have heard that Traidcraft plc, our sister business, is having to change how it operates. Following financial challenges, from next year it will be downsizing and selling a more limited number of products. Whilst it is wonderful news that the plc has found a way to continue its mission, unfortunately, for many of the craft producers, like Noah’s Ark, this means an end to the orders they have relied on for many years. As Traidcraft plc’s sister charity we want to offer support to these producers, helping them find new markets for their products and embrace a bright and secure future - but to do this work, we need your help. In order to provide the support needed for these vulnerable producer groups, as well as honouring our commitment to people we already work with, we need to raise far above our usual income. You can support the appeal by donating here. It’s not just Traidcraft plc producers who will benefit from the donations you give this Christmas time. Traidcraft Exchange works with over 300,000 people across the world, helping them to get a decent income from the hard work they do everyday. As well as supporting Traidcraft plc producers, your donation will help fund projects across some of the poorest communities in the world in Africa and South East Asia, helping them to come together and get the skills they need to negotiate higher wages, better working conditions, and a fairer future for their families and communities. At the heart of both Traidcraft plc and Traidcraft Exchange is a shared mission – to build a world free of injustice in trade. As a supporter, we know you share this belief. But how much do you know about our history? While many early fair trade organisations were set up by, or emerged from, charities, the early years of Traidcraft plc were as a standalone business. The founders wanted to show that trade, not aid, was the way forward. A few years in, some supporters of Traidcraft suggested Traidcraft plc should set up a charity. These supporters had begun selling Traidcraft products in churches and community shops and wanted to donate their profits to a good and related cause. The idea behind the charity was simple; use these profits to educate consumers in Britain about alternative trade, both to help increase sales, and work with those producer organisations who supplied Traidcraft plc with products. Traidcraft Exchange is a registered charity, and has always been run entirely legally separately from the plc – funded by gifts from supporters, project funding from organisations like DfID, and donations from those who round up their orders when they shop with the plc. As a charity, Traidcraft Exchange doesn’t receive any money from the plc or its profits, but relies on voluntary funds, raised by people who are passionate about making the world fairer. Traidcraft Exchange started looking beyond the producers who supplied Traidcraft plc the company, and found opportunities to work with even more vulnerable farmers and artisans who were trading in local and regional markets – people living in often extreme poverty, who may never export to the UK, but nonetheless could harness the power of trade to lift themselves out of poverty. Working with local partners, and drawing on Traidcraft plc’s experiences, we’ve supported small-scale tea growers, cotton farmers, jute growers, craftspeople and others to come together, develop a collective voice, build their confidence and get the relevant training to meet the challenges of rapidly changing markets. Since 1986 we’re proud to say we’ve helped thousands of people across some of the world’s poorest communities to work their way out of poverty. How do we help people? We run programmes in developing countries, supporting poor and vulnerable people to get a better deal from trade. With your support, we campaign to transform the way trade works - aiming for high-impact, sustainable change. We advocate for better trade policies and better business practices in the UK. Having been formed by Traidcraft plc, Traidcraft Exchange still works closely with the business, and many people still support our work through donating their profits back to the charity and making top up donations when ordering stock. As Traidcraft plc will be downsizing and restructuring, the funds received from donations of profits and top up donations to the charity are likely to decrease by around 40%. We are therefore working hard to ensure we minimise the impact of such a significant reduction in funding on the 300,000 people we are currently working with across the developing world. At the same time we are trying to raise some additional funds to assist those plc producers who have been affected by the downsizing of the business. Our small team of experts have worked with producers all over the world, and are offering their expertise to some of those groups affected by the restructure of the business. We’ll be developing tailored plans for affected groups we believe we are able to help, focusing on things like finding new buyers and new markets, support with new designs and alternative products, and advice on setting up export processes. Where necessary and funding permitting, we’ll offer direct financial support, especially for those groups who run community outreach projects which will need urgent short-term funding. Alongside this, we will be continuing our core work, supporting some of the world’s most vulnerable to secure a fairer future and get a better deal from trade.